Skarv field commenced production in December 2012. The Skarv field is produced through 16 wells. The Skarv FSPO has an oil production capacity of 85,000 barrels a day. The Skarv field is located in the northern part of the North Sea. Seabed topography of the Skarv and Idun fields. The Skarv and Idun fields are located between the Norne field (35km to the north) and Heidrun (45km to the south) in Production Licenses PL212, PL262, PL159. Water depths lie between 350m and 450m. The unitised equity is BP (23.835%), Statoil (36.165%), E.ON Ruhrgas (28.0825%) and PGNiG Norway (11.9175%). BP is the operator for the project. In 2007, BP submitted a plan for the joint development for the fields. Production from the Skarv field started in December 2012. The field is expected to produce 125,000 barrels of oil equivalent per day (boe/d) by the mid-2013. The Skarv oil and gas field was discovered in 1998. Skarv (proven in 1998) and Snadd are located in the licenses (sub-blocks 6507/5, 6507/6, 6507/3, 6507/2). Nearly 80% of the recoverable resources on Skarv are gas and the remaining 20% are liquids. Idun was discovered in 1999 and is primarily a gas field. The field is located in PL 159 (blocks 6507/3-3). The fields contain hydrocarbons at three reservoir levels and the total recoverable resource basis is estimated to be 16.8 million cubic metres of oil and condensate and 48.3 billion cubic metres of rich gas. "In 2007, BP submitted a plan for the joint development for the fields. Production from the Skarv field started in December 2012." The fields have been developed using a large production vessel (FPSO), to produce from the subsea wells, and an 80km gas export pipeline connecting to the Åsgard Transport System, at a total cost of around NKr30bn. The fields have been developed using 16 subsea wells. BP awarded the $265m EPC (engineering, procurement and construction) contract for the Subsea Production System (SPS) to VetcoGray. The four-year contract included the detailed design, project management and supply of equipment. The main work took place in Haugesund and Billingstad in Norway, Aberdeen and Nailsea in the UK. Subsea 7 was awarded the $125m contract. The company engineered, fabricated and installed 42km of single flowlines. These consisted of 35km of 12in and 10in-diameter clad production flowlines and seven kilometres of 10in-diameter carbon steel gas injection flowlines. A direct electrical heating (DEH) cable has been attached to the 13km Idun flowline, which is a part of the 35km production flowline. "BP awarded the $400m contract for fabrication of the Skarv FPSO hull to Samsung Heavy Industries in South Korea." Flowline fabrication was to be carried out at Subsea 7’s pipeline fabrication facility at Vigra, on the west coast of Norway. It commenced pipeline fabrication in early 2010. Subsea 7’s pipelay vessel Skandi Navica was used for offshore operations at the fields. Aker Kvaerner had won the NKr100m front-end design job for the new floating production facility as well as the overall system design for the field and preparation for procurement and project management of the total field development. BP awarded the $400m contract for fabrication of the Skarv FPSO hull to Samsung Heavy Industries in South Korea. 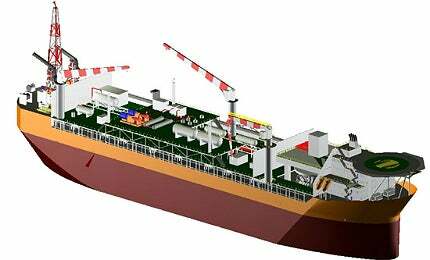 The FPSO has a length of 292m, breadth of 50.6m and is 29m deep. The hull weight, including living quarters, which accommodate 100 people in single cabins, is 40,600t. The hull was delivered in 2010. The FPSO has an oil production capacity of 85,000 barrels a day and gas production capacity of 19 million cubic metres per day. Samsung in Goeje Island, South Korea, also won the $350m contract for the FPSO topside fabrication and installation (TFI) – including around 16,000t of topsides systems. The contract covered fabrication of six main modules, each weighing approximately 2,500t, and the flaretower, which was mounted on the FPSO in a yard on completion of the passage from the TFI yard. On completion of fabrication and quayside commissioning activities the modules were installed on the Skarv FPSO deck. In addition to the work associated with mounting the flare in an onshore yard, the vessel’s five thrusters were also fitted, after undergoing a trial fit and removal for the voyage. The construction of the topsides modules started with first steel cutting in December 2008, and the complete FPSO left South Korea by the end of 2010. The Stella oil and gas field is located in the UK section of the Central North Sea.